While many organizations are doing great work to enable community service locally, it's not simple to search across opportunities from a variety of places to find what's right for you. We have some experience finding relevant information from among many scattered sources, and when we learned that President Obama and the First Lady were making community service a top priority even before taking office, we thought we could help make a difference. With our mission in mind, a group of "20%" engineers, designers, and program managers from Google and other tech companies began work on All for Good, a new service to help you find volunteer events in your community, and share those events with your friends. 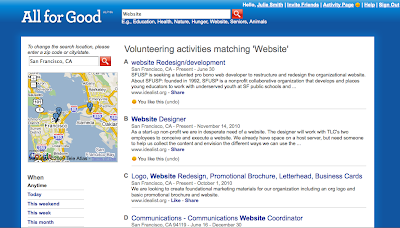 All for Good provides a single search interface for volunteer activities across many major volunteering sites and organizations like United Way, VolunteerMatch, HandsOn Network and Reach Out and Read. By building on top of the amazing efforts of existing volunteer organizations like these, we hope to amplify their efforts. And in the spirit of open data, All for Good has a data API that anyone can use to search the same data displayed on the All for Good site. All for Good was developed entirely using App Engine and Google Base, with the full code repository hosted on Google Code Hosting. We'll be inviting developers to contribute to the open source application soon, so stay tuned. Just as releasing the Maps API led to an surge of independent and creative uses of geographic information, we've built All for Good as a platform to encourage innovation in volunteerism, as much as an end product in itself. We hope software developers will use the API or code to build their own volunteering applications, some even better than the All for Good site! And if you want to volunteer your video-creating skills to make a difference, check out YouTube Video Volunteers, a new platform designed to make connections between non-profits with video needs and skilled video makers who can help broadcast their causes through video. All for Good is a new kind of collaboration between the private, public, and nonprofits sectors to build free and open technology to empower citizens. Similar to the Open Social Foundation, we helped create a new organization called Our Good Works to make sure that the API, the platform, and social innovation that they inspire are supported for the long term. The leadership includes Reid Hoffman, Chris DiBona, Arianna Huffington and Craig Newmark on the board, and the organization aims to build support volunteerism services like All for Good. Today the First Lady is in San Francisco calling on Americans to improve our communities by rolling up our sleeves and putting our time and talent towards doing good. You can learn more at serve.gov, where we're proud to power search.